Scott Morse grew up in Vermont. I don't know him very well, but I do know that he recently moved to Marstons Mills, and that the transition must have been hard. Having spent four years in Vermont myself, I know that when you leave, it isn't just real fall foliage and Mobil station stops for Ben & Jerry's seconds and warm, early springs you give up. You also leave apple cider donut territory behind. 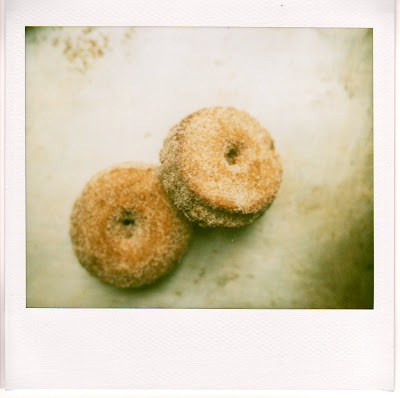 Maine, where I grew up, is also an apple cider donut place. Every respectable pick-your-own orchard has a recipe, and you eat the donuts hot, after you pick. You get a paper cup of steaming cider for dunking, and you sit with your family on a bench or hay bales or in the back of your pick-up truck. While the cashier weighs and tallies up your haul, you watch your cider fill with cinnamon flecks and floating crumbs, and you wash one, one-and-a-half, then two donuts down. It isn't the sort of tradition you want to give up, but until a few weeks ago, I had never seen an apple cider donut on the Cape. That's where Scott Morse comes in. A few years back he left home and went out into the world and came to the same conclusion I did: that a life without apple cider donuts wasn't the sort he wanted to live. But instead of driving home to the Common Ground Fair each September for a visit, he set out to learn how to make apple cider donuts on the Cape. He and his friend, Patience Thomas, already ran a bakery operation, Great Cape Baking, in Marstons Mills. They moved into a new space with a fry-o-lator and a master donut maker came in to teach Scott how to do things just right. He learned how to make the dough: flour, cinnamon, nutmeg, baking soda, with tiny minced dried apple flecks mixed in. He learned to use the cider hot, not cold, and to keep every step of the dough at room temperature along the way. He made batch after batch of dough in the bakery's big, Hobart mixer, and he developed a system for frying and drying and sugaring the donuts that he thought made them less greasy, lighter on clothes and hips. He learned to work the dough from start to finished product in under 30 minutes, just fast enough that the baking soda would set, but not so long that it would cease to act. Finally, he started experimenting on his own. He had a bag of local dried cranberries lying around, and folded a handful into the dough. He made sure that none stuck out the sides (they'd burn), and tossed a few into hot oil. 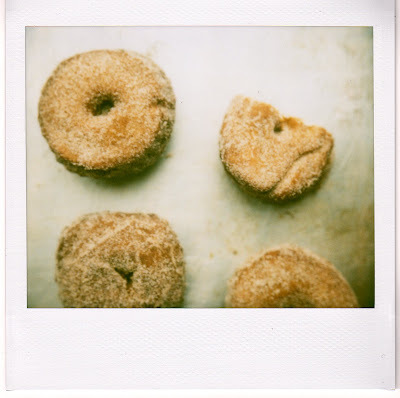 What emerged was the very first batch of Cape Cod Cranberry Apple Cider Donuts—an immediate smash hit. These days, Scott sells both his classic apple cider donuts and the cranberry twist at the bakery's little front at Cash Market in Marstons Mills, and also at the new winter farmers' market at Liberty Hall. He gets in every morning at 3am to roll out the dough, and you can tell, from watching him, that he loves the process. But he says the best part is watching his customers' faces change as they dig in—women with kids, contractors holding hot coffee, men brushing cinnamon sugar off their business suits. They savor it at first, he says, a little bit in awe, and then finally, they break into a grin. Clearly, he and I aren't the only ones missing home. Note—updated 10.30.10: Great Cape Baking is no longer at the Cash Market in Marstons Mills. I have tried to no avail to get some hard facts, but in lieu of those can offer this: I heard that they moved to a location in Hyannis, but that it fell through, and they were still selling at the farmers' market in Sandwich until that closed for the season. I haven't heard whether or not the Marstons' Mills Winter Farmers' Market is going to happen again, but if it does, I'm hoping to find the donuts there. My sister was the first one to try this recipe. She made it this fall when she was home for a visit, and my parents promptly helped her devour almost every single one. (She did, to her credit, bring me a few leftovers in a plastic bag.) We all agreed that they tasted just as good as the ones we've had at pick-your-own stands in Maine and Vermont. I changed things a bit on Scott's advice—he recommended doubling the amount of apple cider, whisking in a tad more nutmeg, and adding in chewy cranberries to give things a Cape twist. This man is serious about his apple cider donuts, and when it came to the tweaks, he was dead right. Just be sure to fold the cranberries in so that they aren't sticking out anywhere from the dough—otherwise, when they hit the oil, they'll burn. Oh! and if you're looking for a source of local dried cranberries, try here or here. Bring the cider to a boil in a small pot over medium-high heat. Turn the heat down to low and leave the cider to simmer, uncovered, until it reduces down to 1/4 cup. This will take about 35-40 minutes. Meanwhile, whisk together the flour, baking powder, baking soda, cinnamon, nutmeg, and salt in a medium mixing bowl. In a large mixing bowl, beat together the butter and sugar. Add the eggs, one at a time, and continue beating until the mixture is light, pale, and creamy—about a minute. Beat in the reduced cider and the buttermilk, and then fold the dry ingredients in gently until everything is just combined. 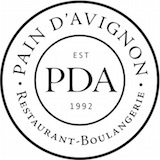 Roll the dough out to 1/2-inch thick on a well-floured surface. Fold it in half and roll it out again. Repeat this process several times until the dough feels smooth and moist but not sticky—it shouldn't cling to your hands. Let the dough rest for 5-1o minutes, then use your hands to shape it into a rectangle, keeping the top smooth and the sides 1/2-inch thick. Press the cranberries evenly into the top of the dough, fold it over once more (so that the cranberries are sandwiched in the middle) and roll it out and shape it into a rectangle again. Use a 3-inch donut cutter (or a round cookie-cutter and a bottle top, if you need to improvise) to cut the dough into roughly 15 donuts. As when you make shaped cookies, you will need to ball up the scraps (but not the holes) and re-roll the dough several times. 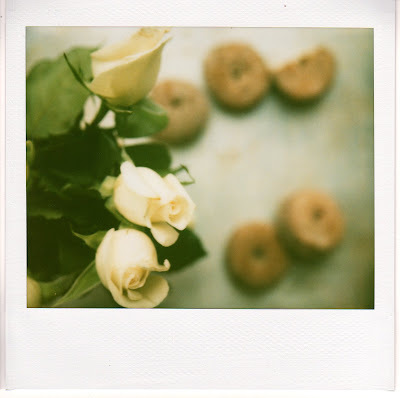 Arrange the cut donuts and holes on a cookie sheet and set aside. Fill a medium-size pot with canola oil so that the oil reaches 3 inches up the side. (After you use this oil for frying the donuts, you can set it aside for general cooking use, so it doesn't need to go to waste.) Attach a candy thermometer to the side of the pot, and over medium-high heat bring the oil to 350 degrees. Drop the donuts in batches into the hot oil using a slotted spoon. They should fry for roughly one minute and ten seconds per side, or until they are a deep golden brown. Use the wrong end of a wooden spoon to flip them through their holes, and pull them out with the slotted spoon. Transfer them to another cookie sheet lined with a clean dish towel or a layer of paper towels. Flip them once so that both sides are patted dry, and let them cool for one minute before rolling them in the cinnamon sugar. Repeat this process until all of the donuts are fried and sugared, and then enjoy them hot, with a glass of steaming cider or coffee. good call on adding more cider. mine were delicious but were definitely more doughnuty, less apple-cidery. i think they could have used some more spices, too. these look DELICIOUS. just need a kitchen all to myself now..
also, im not sure how they work with these donuts and the cranberries, but i am a huge donut hole fan so when i made my batch i rolled about half the dough out for full sized donuts and used the other half just for donut holes. a shot glass works well, or for even smaller donut holes (with a much better sugary-outside to doughy-inside ratio) try something smaller like an apple-corer. tiny, but bite sized and delicious! anna, i like the shot glass technique. i had a seriously difficult time finding two circular instruments to approximate a donut and a hole for cutting. i think i might spend the $5 on a donut cutter next time. plus, i agree, donut holes are just the best. and why keep rolling your dough out when you could be making tiny treats?! If this isn't a reason to get in the car packed to the brim and drive 3,000 miles, I don't know what is. Bite sized dirt bombs better watch out. I can't resist adding to this thread. I was lucky enough to taste some of these donuts, which Scott very nicely sent home with Elspeth. They were delicious! And this is coming from someone who is not really much of a donut fan. I have been won over, however, at least to homemade donuts, first by Anna and now by these. For all those reader out there who think (like I used to) that making donuts is a major pain, relax: it's so much easier than I thought! 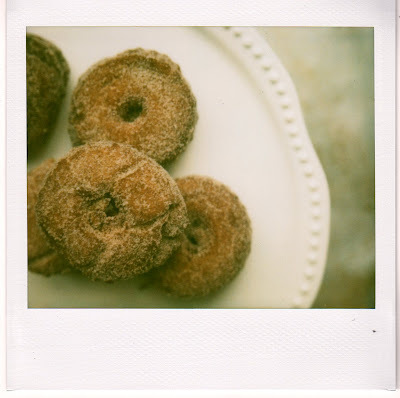 ~Liz P.
I just said aloud -- "Yes, Cider Donut Recipe!" My roommate looked at me like I had 3 heads thinking they sounded awful. She has quite the surprise in store for her when I make them. But it just goes to show that they are indeed a New England product! Can't wait to try 'em.